So, should I install pirated games on Windows 10? 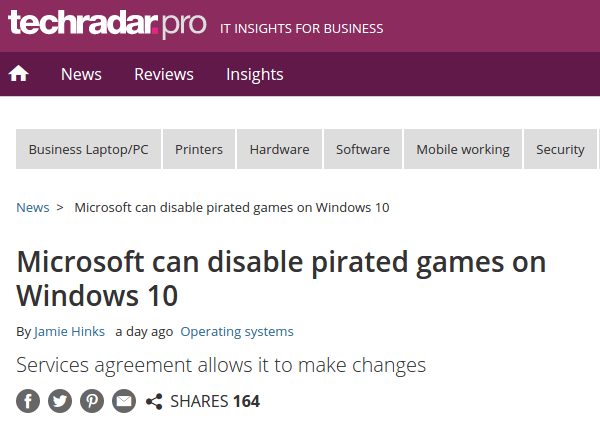 On August 13th, 2015, Alphr.com published a post with a clickbait-y title regarding pirated games on Windows 10. Well, this sounds damn scary, doesn't it? Microsoft invading our Windows 10 PC, searching for pirated games and software and disabling it at will. What provoked the original Alphr post and nearly all the subsequent ones, is a paragraph in the Microsoft Services Agreement, section 7b to be precise. So, does that mean it's official? Did Microsoft come with an iron fist - no, not this Iron Fist - and made Windows 10 the solution against pirated games and lost software publisher revenue? Not at all. This is most likely a misunderstanding from people who didn't read the Microsoft Services Agreement carefully enough. Alphr.com mentions that "Updated EULA terms let Microsoft invade your Windows 10 computer". EULA stands for End User Licence Agreement, the lengthy legal document we click "I accept" before installing most software. It's not a secret that most users don't read the EULAs in full - even though they should. So it would stand to reason that Windows 10 users might have agreed with terms they didn't know about. The thing is that the Microsoft Services Agreement and the Windows EULA are two entirely different documents. 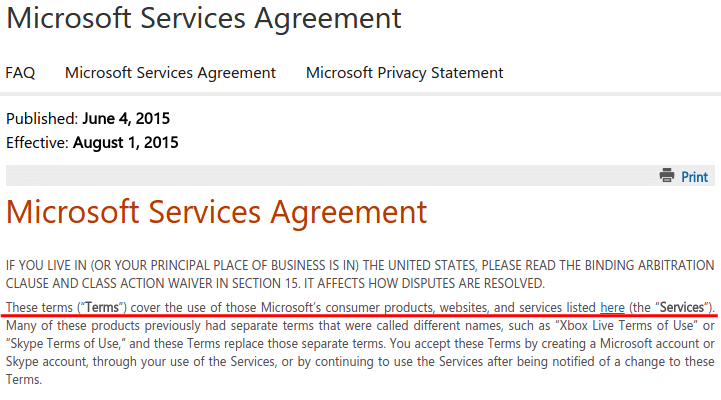 The Microsoft Services Agreement states, in no unclear terms, which products, websites, and services it covers. 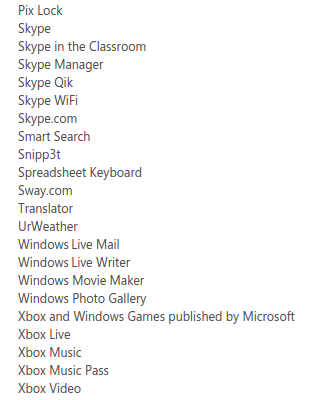 The list of the services covers many of Microsoft's services, including Skype, OneDrive, Office 365, Xbox, etc. What the list doesn't include is Windows 10. The closest it comes to gaming is with Xbox and with Windows Games published by Microsoft. So, no, Windows 10 won't "automatically check your version of the software and download software updates or configuration changes, including those that prevent you from accessing the Services, playing counterfeit games, or using unauthorized hardware peripheral devices." It has no right to do so, based on the Windows EULA. It's safe to assume that the above phrase is about Xbox and Xbox Live, which are included in the Microsoft Services Agreement. Microsoft will issue updates that block unauthorized Xbox peripherals and counterfeit Xbox games. Why would Microsoft care if we have a pirated version of Call of Duty or Assassin's Creed on our PC? Microsoft doesn't own Activision or Ubisoft. It doesn't stand to win or lose anything because of other publishers' pirated games. The only reasons Microsoft is interested in PC gaming are Minecraft, the Halo series, and any Microsoft produced mini-games sold at the Microsoft Store. It makes no sense that they would go out of their way to stop piracy for games and franchises they don't own. 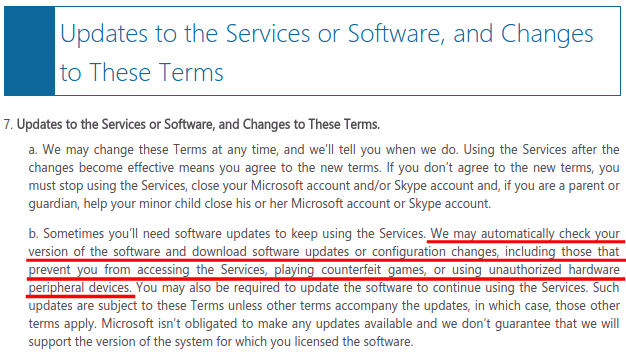 Also, the Microsoft Services Agreement doesn't mention Windows 10, or any other Windows version. 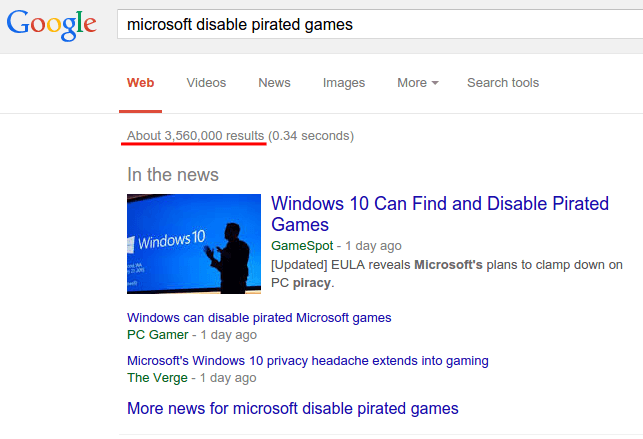 If Microsoft were on a witch hunt for pirated games, it would be on every version of Windows. 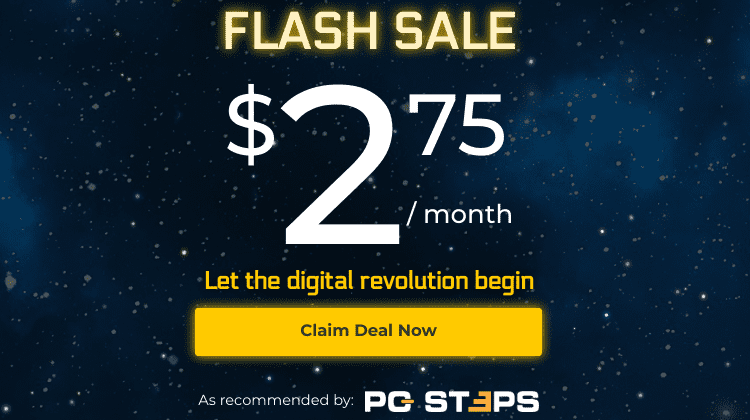 Here on PCsteps, we don't support software piracy, whether it is pirated games or cracked software. Do you have anything to add to this story? Leave us a comment. Then why does the demo version of the original Minecraft work, but the pirated version doesn't? I've been noticing a big trend in this kind of "piracy detection"' software. Why would microsoft care about other game developers? Simple really. It's become a multi million dollar industry to rat people out. For a while there you would see advertisements on facebook "know someone running pirated software we will pay you up to 1000$ for information"
Just like with torrents it use to be a huge market for "lawyers" who would send letters in the mail and get money with little to no proof anyone was even pirating software. Since those days buisness has slowed people are more careful so those greedy vultures are looking for more ways to get rich. Licensing is one of those ways. You think about it you have software out there like autocad that is 1000$ software. Even if autodesk only gets 10% and a laywer gets 90% that's a win for both the greedy lawyer and the software companies. 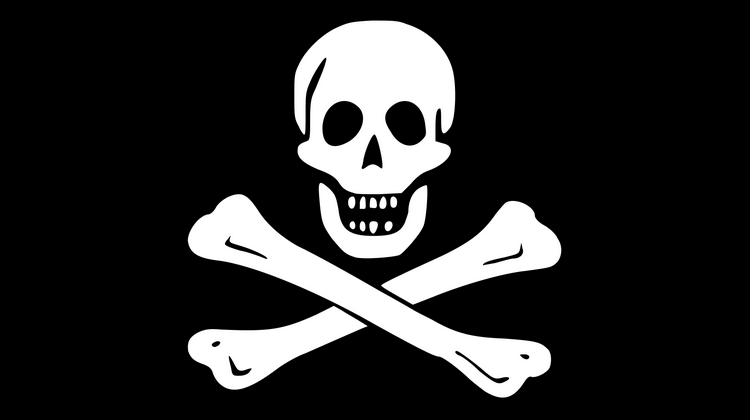 Software developers can end piracy and lawyers make tons of money. Thus it would be very beneficial to microsoft to rat people out in exchange for a piece of that pie. Furthermore, i know of atleast one piece of software that even if you have a copy on a cd from 10 years ago within the last 6 months they've added a tracking software to it. So they must have atleast had the foresight 10 years ago to give the ability for them to secretly install updates with out the users knowing. Or they made a deal with microsoft to assist them in detecting unlicensed copies of their software. In addition to this they also made it so their software cant be uninstalled. Sure it cant be ran either but now you're caught red handed with their software on your computer. ... good thing reno uninstall can get it taken off.